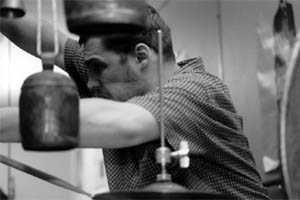 Ingar Zachs solo performances combines the sounds from his singing-bowls, electric propellors on gongs, drones from his sruti-boxes, and his prepared bass drum. The result is an audio expierience that has the recemblence to electronic music. The exploration of the sound itself is more important than the development of musical material in his performances. Ingar Zach wants to create music that leaves the listener(including himself) in a vacuum, unconscious about time and space, only about the sound in the space.